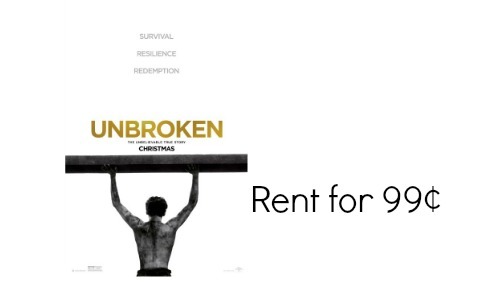 If you haven’t seen Unbroken yet, you can rent it from Amazon Instant Video for just 99¢! You will have 30 days to watch the film after you rent it from Amazon. Directed by Angelina Jolie, this Academy Award nominated film is based on the book by Laura Hillenbrand and focuses on the life and struggle of Louis Zamperini before and during World War II. It’s a really great film and well worth watching. I wouldn’t watch it with young kids though.